This durable KitchenAid<sup></sup> gas grill is built with premium corrosion resistant materials to provide years of cooking entertainment. The small footprint and foldable side shelves make it perfect for the griller with limited outdoor space while the heavy duty stainless steel wrapped cooking grates provide a surprisingly large cooking area. Its stainless steel burners and angled flame tamers reduce flare-ups and create Even-Heat<sup></sup> across the entire grilling surface. Plus, the KitchenAid<sup></sup> gas grill also includes a free premium cover. The Broil-Mate<sup></sup> 116457 features a deep, thick oven made from cast aluminium that effectively retains heat and can withstand intense temperatures, best of all it will never rust. The stylish stainless steel lid insert is insulated from direct heat protecting it against discoloration. The sleek and sturdy pedestal base provides long lasting durability that will stand up against the harshest outdoor conditions. Stainless steel hood panel with stylish aluminium end caps as well as a stainless steel cookbox with cast aluminium end caps. Black powder coated side shelves with stainless steel control panel and shelf fascias. Enclosed cabinet with stainless steel cabinet doors on heavy-duty locking swivel casters. Therma-Cast aluminium oven with stainless steel lid insert, black painted steel drop down side shelves with integrated tool hooks heavy duty black painted pedestal with resin base. 7 inch wheels with decorative grey accent and 2.5 inch locking casters. Quality epoxy paint finish. Cool-To-The-Touch thermonylon handle. Stainless steel spider guards. Rust resistant zinc coated steel components. 2-Burner Patio BBQ in Black This durable KitchenAid<sup></sup> gas grill is built with premium corrosion resistant materials to provide years of cooking entertainment. The small footprint and foldable side shelves make it perfect for the griller with limited outdoor space while the heavy duty stainless steel wrapped cooking grates provide a surprisingly large cooking area. Its stainless steel burners and angled flame tamers reduce flare-ups and create Even-Heat<sup></sup> across the entire grilling surface. Plus, the KitchenAid<sup></sup> gas grill also includes a free premium cover. 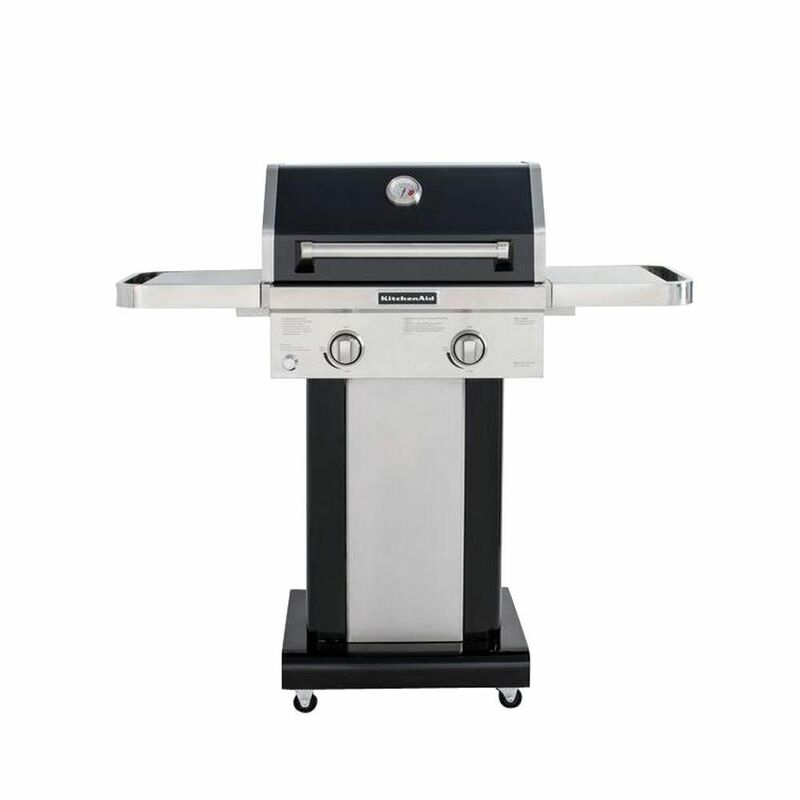 2-Burner Patio BBQ in Black is rated 3.9 out of 5 by 321. Rated 2 out of 5 by DisappointingGriller1 from Purchased this grill 13 months ago. Grill cover is tattered,torn and dried out. Inside of grill... Purchased this grill 13 months ago. Grill cover is tattered,torn and dried out. Inside of grill is rusting, both ledges that the heat hoods set on have completely rusted off. I had to insert 4 screws for each head hood after 10 months to keep in working order. Outside is perfect, grates are perfect. The rest of the inside is terrible. Seems like 300.00 would get you a grill that lasts longer than 1 year. Very disappointing . Rated 5 out of 5 by es from We wanted a grill, but at the time lived in a condo and had a small porch. This was the perfect ... We wanted a grill, but at the time lived in a condo and had a small porch. This was the perfect size. We still have it at our larger home. It isn't huge, but we have used it numerous times to cook for parties and have always had plenty of room for lots of burgers and dogs and grill veggies frequently. We were able to convert it to natural gas (with a separate and fairly expensive kit) and then back to propane. Easy to use. We've experienced no problems. It is difficult to clean under the cooking grates though, but we also don't keep up with it like we should. Rated 1 out of 5 by FredP from Igniter stopped working less than a year after we bought the grill. Igniter stopped working less than a year after we bought the grill. Rated 4 out of 5 by Bill from HAD THIS UNIT BEFORE. THIS ONE THE IGNIGHTER DOES NOT WORK. TRIED NEW BATTERY STILL NOT WORKING. HAD THIS UNIT BEFORE. THIS ONE THE IGNIGHTER DOES NOT WORK. TRIED NEW BATTERY STILL NOT WORKING. Rated 5 out of 5 by Anonymous from Even heat; Easy cleaning; Great cooking / does not... Even heat; Easy cleaning; Great cooking / does not have a searing burner, but very easily holds 450 degrees. The only complaint I have is: heating rack should have been an inch higher. Overall quality of the unit was very good / light years ahead of some of its competitors. Rated 5 out of 5 by Moneypit18 from Great little grill bought it on sale199.99 saved 100bucks. Well made heavy duty. Great little grill bought it on sale199.99 saved 100bucks. Well made heavy duty. Rated 1 out of 5 by Matt from THIS PRODUCT WILL RUST THROUGH IN THE FIRST YEAR....FOR SURE. We had ours covered whenever not i... THIS PRODUCT WILL RUST THROUGH IN THE FIRST YEAR....FOR SURE. We had ours covered whenever not in use but it still rusted through. Rated 5 out of 5 by Hunters from We purchased the floor model and it the perfect grill for us. We grill all year long and it also ... We purchased the floor model and it the perfect grill for us. We grill all year long and it also came with a grill cover!!!! I'm interested in buying this BBQ but I need it to work on Natural Gas. In the description it says: &quot;compatible with NG kit model #710-0001&quot;, although this part does not show up on Home Depot's website. Any idea where to get the kit?